EMG helps make your team better by allowing you to focus on your critical business needs. We'll manage the day-to-day details of your project(s), while you become the program manager. 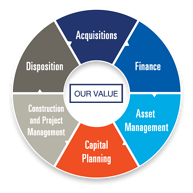 Whether you need assessments upon acquisition or disposition, facility planning services or project management, or simply need extra capacity; we offer the real estate life cycle services to get the job done. EMG is saying "yes to more" of your service needs, today.